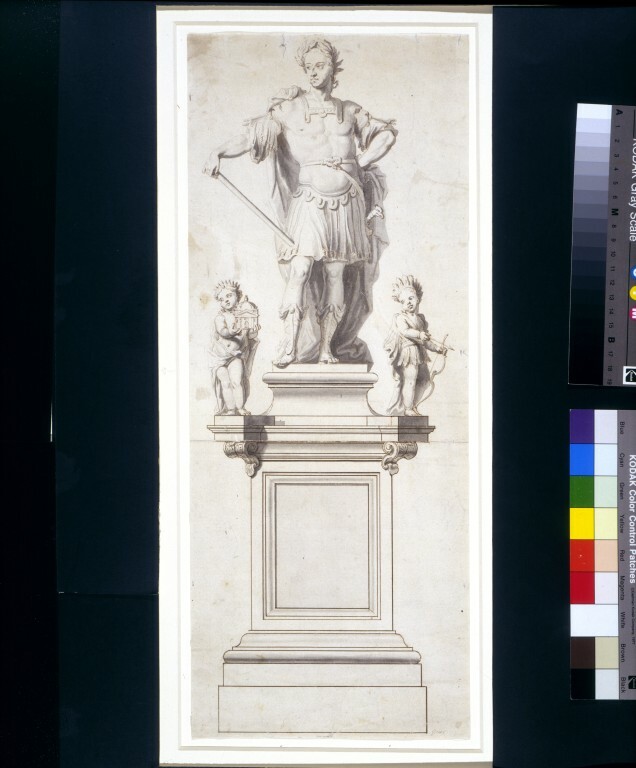 This preparatory drawing was probably shown to the client, William III. There are very few identified drawings by Nost, the others being in the Bodleian Library, Oxford, and the British Museum, London. William III, who reigned with his wife, Mary II, from 1689 to1702, is here portrayed in Roman costume. The central figure is flanked by two putti symbolising the continents of Europe and America. The work might have been intended as a companion to a statue of Mary with the other two continents. John Nost was a native of Malines in The Netherlands. He is first recorded in England around 1678, working at Windsor Castle under Hugh May. His workshop was in the Haymarket and he specialised in lead figures, though he also worked in other materials, such as stone and terracotta. The workshop made a number of pieces for William III's gardens. 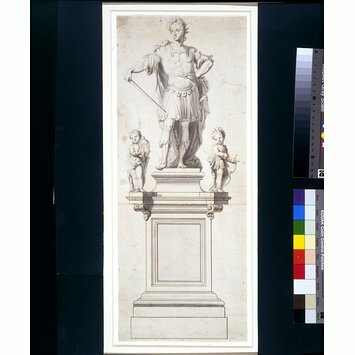 Other statues by Nost also show the King as a Roman emperor, including two in lead, one at Wrest Park, Bedfordshire, and one in Portsmouth Dockyard, Hampshire, which could relate to this drawing.